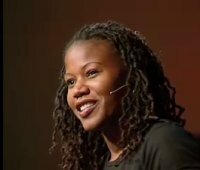 This article reviews a fantastic talk by Majora Carter titled “Greening the Ghetto” at TED. I loved this emotionally charged talk detailing her fight for environmental justice and her efforts as director of Sustainable South Bronx. 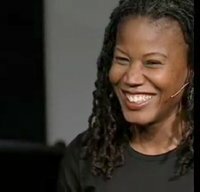 Majora Carter’s TED talk has both incredible strengths — passion, energy, authenticity — and one unfortunate weakness — rapid speaking rate. Both extremes are worthy of public speaking analysis. What is Phenomenal about this Speech? She personalizes her story all the way through the speech. She capitalizes on alliteration: “pimps and pushers and prostitutes” (6:50) and repetition: “economic degradation begets environmental degradation which begets social degradation” (7:24). Her presence exudes power and confidence without a trace of arrogance, fear, or condescension. In short, Majora Carter exhibits incredible passion — more in 19 minutes than many of my college professors in an entire semester. Her message is captivating, and her enthusiasm is infectious. 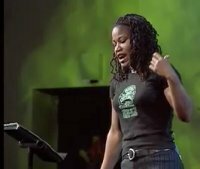 All speakers can learn from Majora Carter. She speaks rapidly—bordering on too rapidly, but she is articulate at all times. And she slows her cadence for her most important points. You can tell that she’s trying to observe her time limit—communicating that she respects the audience’s time. While I agreed with much of Guy Kawasaki’s analysis, I believe he is being too generous on this point. Majora Carter speaks too fast for much of this talk. Period. It does not “border on too rapidly.” It is too rapid. How much can I cover today? How much can my students absorb today? While Majora Carter may be respecting the audience’s time, she is not respecting the audience’s capacity to absorb information. I have the luxury of watching this video three times, pausing, and rewinding to get the meaning. This is a luxury that your audience rarely has. More importantly, your audience will rarely give you more than one opportunity. Overloading them with information is not effective. Her speaking rate is so fast that she trips over her own words multiple times. At times, she seems breathless. Used sparingly, a rapid speaking rate can be used to very good effect by a speaker. However, when most of the talk is delivered at this rate, that’s a clear sign that too much information is being presented. What’s the Solution? Aggressive Editing. If you have a 20-minute time slot and 40 minutes of information, the solution is not to double your speaking rate. The solution is to cut the material in half. Keep the best lines, the best stories, and the most powerful images. Be ruthless in trimming the rest. Depending on your speaking scenario, you may be able to include additional facts, figures, statistics, stories, and diagrams in handout material for the audience. What about Reading from a Script? It is generally better to avoid reading from notes, but that in itself didn’t bother me in this presentation. Despite frequently reading, Majora connects deeply with the audience throughout the talk. Her face is expressive, her body is active, and her vocal variety is excellent. She compensates well for the use of notes. The indirect problem with reading notes is that it encourages rapid delivery. This is a problem that I have personally battled. In the past, I often wrote with red pen in margins of my notes: “SLOW DOWN!” In recent years, I go without notes or with only a few key phrases to guide me along. The time it takes me to occasionally catch my thoughts is time well spent — it allows the audience time to digest what I’ve just said. Did you enjoy this speech? What did you like most? What did you think of the speaking rate? This speech had terrific content but the rapid speaking rate was the spoiler. In the beginning she was reading the speech which enabled her to race through the words leaving the audience (me for sure) exhausted just trying to keep up with what she was saying. This is a subject that is near and dear to her heart. She knew the material. It “was’ and ‘is” her life. If she had dropped the script, she would have automatically slowed down. She would have nautrally paused after saying something profound, like we all do naturally when we tell a story. I also wonder why she never attempted to make her stats more credible by giving the credits for those stats. 25% will have diabetes, 1 in 4 will get this, 1 in 6 live in..etc. Says who…is what I ask when i hear someone ramble stats off with no backup or research body mentioned. So my second suggestion for her would be to back up her stats so it doesn’t sound like she’s just making up numbers as she goes. Aside from this, it was a compelling speech and contained many of the key elements that could have easily made this “good” speech into a “great” speech. I could not agree more about the critique. Her headlong rushing is a significant turnoff. I found myself tuning out in spite of the fact that she has a compelling message and has many other good qualities as a speaker. I was interested in hearing her speak when she wasn’t racing the clock. Hence, I found this video on YouTube. In this video, she’s not rushing anymore but she’s using a lot of verbal filler (“and uh”) rather than pausing. Well, I have to admit the information is very important and interesting. This lady had her way of introduction, her body, and her conclution As we know, her speack was based on a manuscript delivery. The problem is, she read a million miles per hour which made her delivery poor. As far as her goals, it does take a strong caring person. Good job. The toastmaster in me wants to say you are dead on, but at a base level, I’m not sure you are right. The ultimate goal of any speaker is to connect and grip the audience with their message. There is no question in my mind she did this. Part of the reason she did, is she was a living embodiment of courage. The fact that she spoke so rapidly and and barely made eye contact as she rattled off facts and statistics a beautiful mind served to highlight her very courage and rarity. This in turn convinced us we can’t afford to waste her. I mean when it is this hard for someone this smart, passionate and gifted to rise out of the ghetto to get here, then we can’t afford to waste her. I think that was her implicit point. Perhaps, if she had been a well rehearsed presentation person, it may have worked against her. Having said all that, I understand your point. I found myself very lost fast as I couldn’t process all of her thoughts and figures. Speak, girl! She is the Black Ann Coulter. She knows her arguments and is passionate about what she believes. I would just say might want to work on avoiding the big gasps of air. Great humor, great emotion. I think it was an excellently organized and well structured presentation. Boy, this speech is not really a speech, it is a lecture, read at breakneck speed. I lost her in the first few minutes, despite the important content. I give her credit for her courage and persistence and passion. Too much info, and has been mentioned already s, reading invites racing. And gulping breath. It would have been good to work with a coach prior to delivering this speech to cut down on the info and to work on the pacing, include pauses for impact and to give the audience time to digest the info and the speaker time to breathe. Less is often more, it can’t be said enough. I have watched the speech and read the analysis. This would have been an inspiring speech except for the fact Ms. Carter spoke entirely too rapidly. She crammed way too much information into a 20 min speech. After reading the speech I realized I did not catch half of what she was saying. Her cause is great and she does personalize it, but without catching half of the information she presented it made it hard to keep focused on her major point. The content of the speech was great, however Majora spoke way to quickly. Within two minutes, I was tired of keeping up with her message. Majora didn’t give enough eye contact with her audience. I think giving eye contact and not eye scanning is important. It acknowledges who your speaking to and it commands attention. She gave subtle gestures. I thought maybe she could of took a few steps to her right and left on the stage, allowing the audience to get a better look at her. For this speech to be dear to her, I would have never known. She didn’t emphasize her main points or her hand gestures. Her hands were moving in a sloppy manner, indicating she was nervous. Though the content was great, the delivery was not great at all. She could have prepared her speech a little more thourougly. I also think humor incorporated was great, to keep the audience from being too uncomfortable, however when she started to break down I really felt uncomfortable. I think a pause to regain her composure would have helped her voice from cracking. Tough critique, but I’m taking a speech course, so I’m just practicing! No intention to be negative. I have to agree with some people that Majora did speak too fast. But she also was not afraid to express her emotions. I’m sad to say though the rapid speaking took a lot away from the wonderful story. She also did a good job using body language. I liked how even though she talked fast she kept the audience going by entertaining them with some humor. She spoke fast because it was a TED presentation and the presenters have a very limited time to present. Having a “limited time to present” is no excuse for speaking too fast. The solution is to plan your presentation with the appropriate amount of material for the available time. So true. It’s easy to speak within a time limit: Just say less or talk faster! But we also have to consider if we’re giving our audience time to digest our message. This is one of those odd times where the speaking pattern so closely matches the speaker and somehow the purpose of their speech, that her speed did not bother me. The speach I’m positive was great and very informative but the rapid pace in which she spoke felt like a race for something and way too fast. She began to lose my attention. I became bore with it and didn’t listen to the final speach. Slow down and connect with your audience. Majora Carter gives a very informative speech on the Ghetto. She paints an ugly picture of factories, pollution, and no public parks. Her speech is well thought out and organized. Her speech was timed and she was very rushed and spoke rapidly during her speech. She often tripped over her own words and did not take the time to slow down and compose herself. She read from a script and did not make good eye contact with her audience. She could have improved her speech by pausing after dramatic statements and editing her speech. The information she gave was great but she did not state where she got her information and there was simply too much information to take in. In the beginning of her speech she had her hands tightly clasped behind her back, but as her speech went on she used good hand gestures. She showed emotion in her speech which allowed the listeners to sympathize with her. She concluded her speech with a great call-to-action. The speech is full of enthusiasm and good contents. I want to say the advantages it has. Firstly, it has rich contents and enough evidences, it is beneficial to her sad experiences. The second is her enthusiasm, her speaking is extremely persuasive. Because what she said is all what she has gone through, which made important impacts on her lives. Though the telling stories, she describes clearly what she wanna express to us. But the shortcoming is her speed of speaking, it is too fast to get catch with it. there are many contents we need to adopt, plus fast speed, causing that we can’t understand clearly. Besides, she always downs her head and sees the draft, laking the eyes communication with audience. She pays too much on what she said but ignored her audience to look cace of. On the plus side, even though she spoke fast, she did enunciate well. – Passion for her subject that brings the audience in. – Knows her subject well and makes great suggestions for making things better. – Used notes way too much – reading from them. This was distracting and kept her from connecting well with the audience with eye contact. If she would have used eye contact I believe she would have slowed down and been perceived as much more sincere. – An attention grabbing introduction would have been helpful. – Talked in monotone at times – again due to reading from a script. 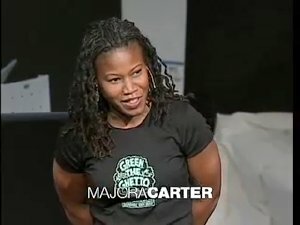 RT @6minutes Video Critique: Majora Carter – Greening the Ghetto (TED talk 2006) http://bit.ly/1ZOBNk Mssge: Take it slow and don’t read!